New Zealand scored 469 runs in their first innings and declared the second one at 7-287 in 90 overs. Bangladesh gave a sterling response while blasting 501 in the first innings and registered 173 for the loss of three wickets in 48.2 overs. Sohag Gazi (Bangladesh) was declared ‘Player of the match’ for his stunning all round performance in the game. 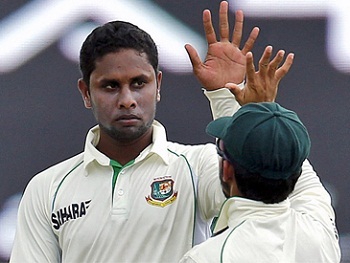 The first Test of the series concluded on Sunday, October 13, 2013, at Zahur Ahmed Chowdhury Stadium, Chittagong. Earlier, the Kiwis started the day at 1-117 after 40 overs, Peter Fulton along with Kane Williamson were batting at 44 and 28 runs respectively. They got off to a typical Test mode by scoring 22 runs in the first 10 overs as Fulton brought up his fourth Test fifty in the process. The score was taken to 149 in 56.6 overs when he was declared leg before wicket off Sohag Gazi for 59 off 189 balls with 2 sixes and 3 fours. Ross Taylor came in next while Williamson crafted his 9th Test half century at the other end on the 119th ball. The latter hit the first six of the day in the 70th over and the second hundred of the innings was displayed on board four overs later. Kane Williamson was caught by Anamul Haque at short leg off Sohag Gazi for 74 off 150 with 1 six and 2 fours. The skipper of the Black Caps, Brendon McCullum, took guards next and lunch interval was taken at 3-218 in 79 overs. Taylor dispatched three successive fours just after the break and McCullum went back to the pavilion for 22 runs. The off spinner, Sohag Gazi, got a hat trick in the 85th over by removing Corey Anderson, BJ Watling and Dough Bracewell on the second, third and fourth deliveries. Ross Taylor remained unbeaten for 54 when the second innings of the Kiwis was declared at 7-287 after utilising 90 overs. Sohag Gazi was the star performer with the ball and grasped six wickets whereas Nasir Hossain held one. The Bengal Tigers required 256 runs to win in the possible 45 overs left in the match. Tamim Iqbal and Anamul Haque initiated the chase half heartedly by scoring 26 runs in 11 overs with 4 fours from the first. Anamul Haq hit 2 fours in the next one and was caught by Corey Anderson off Bruce martin for 18 as the score touched 39. Marshall Ayub joined in next with Tamim Iqbal who added another couple of fours and was dropped at 30. The latter got a chance again when Taylor put down his catch at slip off Kane Williamson 10 runs later. Marshall Ayub hit the first six of the innings in the 28th over and Tamim Iqbal was finally sent back to the dressing room for 46 off 95 with 8 fours. The second wicket went down at 99 and Marshall Ayub was held lbw off Ish Sodhi for 31 two runs later. Mominul Haque and Shakib Al Hasan associated in the center and started playing their shots instantly. The latter hit 2 sixes and even fours in the coming overs as Mominul Haque got his first boundary in the 42nd over. Shakib Al Hasan smashed his 14th Test fifty on just 39 deliveries and remained unbeaten for 50 off 39 with 3 high sixes and 4 fours. 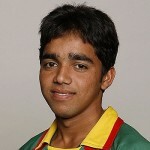 Mominul Haque was at the other end at 22 and Bangladesh reached 3-173 in 48.2 overs when play was called off. Bruce Martin chipped in with two wickets and Ish Sodhi got one. The first Test between the two teams ended in a draw whereas the second and final encounter will commence from October 21, 2013, at Shere Bangla National Stadium, Mirpur.